The only reason I wanted to take the 28 is because I'm a sucker for articulated buses. The 28 uses them all the time, so that's fine with me. The 28 is one of the 7 (!) buses connecting Mattapan and Ashmont stations to the Orange Line. It travels almost entirely on Blue Hill Ave and South St, then diverts onto Malcolm X Boulevard to Ruggles. It's also a Key Bus Route, meaning it runs quite often. The 28 at Ruggles. 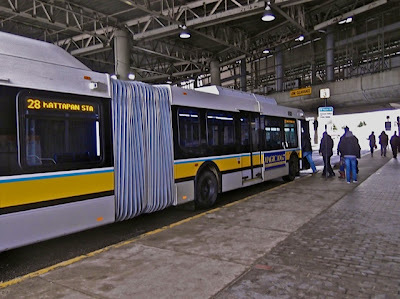 Though you can't tell from this picture, the 28's buses have a more curved profile, in line with the MBTA's older RTS buses. On Sundays, the frequency is every 12 minutes. My father and I had to wait about that time at Ruggles station. Surprisingly, there were only about 5 people, including us, who boarded the 28 at Ruggles. I was surprised, since the route does use articulated buses. 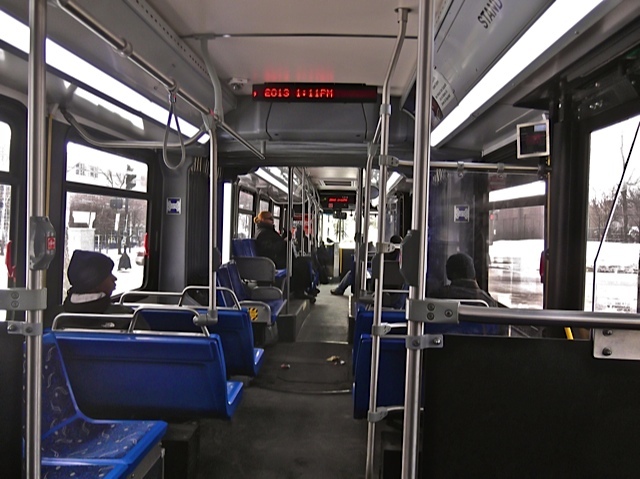 Speaking of articulated buses, the ones used on the 28 are absolutely beautiful. For one thing, they use LED's (as my energy-efficient father noticed), and the lighting as a whole is perfect. Like on the SL5, the seats are cushioned, and it's nice how there's a second screen to tell you the stops in the back. On Malcolm X Boulevard, the bus ran through all the stops (on a side note, I noted that the Roxbury Crossing bus stop is rather far from the station itself), though we did pass a few schools which are probably used on weekdays. Arriving at Dudley, there was a huge crowd of people waiting for the 28. Almost every seat pair had one person in it as we left the station. Taking a very sharp turn (when I realized how hard it must be to drive one of these buses), we pulled onto South St. My father noticed that there were a lot of churches along the route which must generate Sunday ridership. At this point, there were some people arguing behind us. They were making me kind of uneasy, and I was afraid there would be a fight or something (I witnessed this once on a New York subway car; it wasn't pretty). Luckily, they got off eventually. As well as churches, there seemed to be a lot of schools on the route as well, meaning the route must be maddening to ride on weekdays (leave a comment below if you've experienced it). Unfortunately, we also experienced bunching on our ride. It was made worse by the fact that since the buses are so huge, they can't pass each other! But worst of all... it was a Sunday. The bus eventually arrived at Mattapan. Everyone but us and two other people got off at Mattapan Square, while we continued to the station. Since Mattapan Station is on the other side of the road, the bus has to go a little further, then pull a U-turn. I wasn't expecting it, and it made for a nice ending to the ride. Another 28 bus at Ruggles, in a picture taken over 18 months since this post was first published. Ridership: Nobody took the 28 from beginning to end except for my father and I. This is one of those buses that would benefit from fare zones, so people could pay less for going smaller distances. The schools and churches probably generate a lot of ridership on weekdays and Sundays, respectively. Pros: A decent link from Mattapan to the Orange Line. It serves a lot of small businesses along the way. The headways are phenomenal, running as frequently as every 7 minutes at Rush Hour. Plus, the buses used on the route are amazing! Cons: It can be a bit slow, and it's certainly not the best Red Line-Orange Line connector of the bunch. And bunching on a Sunday? What bus does that? Nearby and Noteworthy: Though a couple of other buses go here, the Franklin Park Zoo is worth a visit. There are also the churches and schools mentioned, but I know nothing about them. Latest MBTA News: On March 17, 19, 20, 21, and 24, the Orange Line will operate shuttle buses between Sullivan Square and Oak Grove. Also, "T"rivia night is March 28. Think you've got what it takes? Click here.